In this 23-minute podcast, two Bainbridge retirees – David Harrison and Elaine Von Rosenstiel – explain how they and other islanders (most of them over 65) have created a nonprofit startup company that has an idea and an app to enable Seniors to express their generosity. In the podcast, they tell stories and anecdotes about the inspiration and fun they had developing this inventive idea. They describe their Boomerang Giving website and new smartphone app that enables a Senior to keep track of the dollar amount of senior discounts they receive from day to day. Then, the app allows the Senior to generously earmark those discounts to a nonprofit charitable organization of their choice. So, if a Senior today receives a $4 discount for a ferry ride, track it in the Boomerang Giving app. If, tomorrow, you get a movie discount of $5, track it in the app. 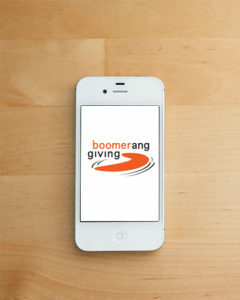 When it adds up to, say, $20, use the app to forward those discounts to your favorite charity that you can choose on the Boomerang Giving website. The mission of this new startup is straightforward: To empower older Americans — including the 3.5 million who are turning 65 each year – by creating new opportunities to give back and join others in strengthening their communities. As they say on their website, Boomerang Giving is a registered 501(c)(3) nonprofit organization started in 2013 by 7 local people who were motivated to do something about the strong desire of older Americans to contribute to their communities in meaningful ways. They realized that the “aging of America” results in 10,000 folks turning 65 each day — that is, 3.5 million baby boomers turning 65 each year. 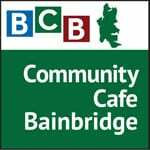 Locally, for example, you can use the app to direct dollars to a nonprofit like Bainbridge Artisan Resource Network (BARN). However, the idea has gone national, and you can choose virtually any qualified 501c3 charitable organization by picking from a vast national database on their website. Credits: BCB host and social media publisher: Barry Peters; BCB audio editor: Chris Walker.